It's Yellow Cab's PAYDAY FLASH SALE! 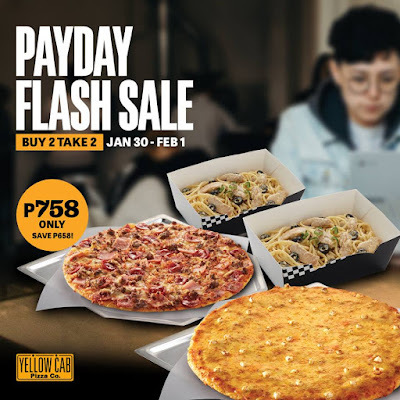 Buy 1 10” Manhattan Meat Lovers + 1 Large Chicken Alfredo Pasta and get a FREE 10” #4 Cheese Pizza + Large Chicken Alfredo Pasta for P758! Promo runs from Jan 30 - Feb 1 and is available for Dine In, Take Out, Voice Call and Online Delivery. When you're ready for the next hustle, call 789-9999.